Welcome back to school! We jumped right into some extra-sweet measuring earlier today. In honor of The Gingerbread Man, and The Gingerbread Baby [Brett], we used two different forms of non-standard measurement to find the length of many objects. The giant gingerbread man you see to the left was measured using Link N Learn links. First, each child estimated how long they thought a particular section might be. Next, the group worked together to align links along various body parts. They recorded both their estimates and the actual length on a diagram. The most challenging portion of this activity was remembering that the links must touch end-to-end for an accurate measurement. The other measuring activity took place across the room in the Math Center. 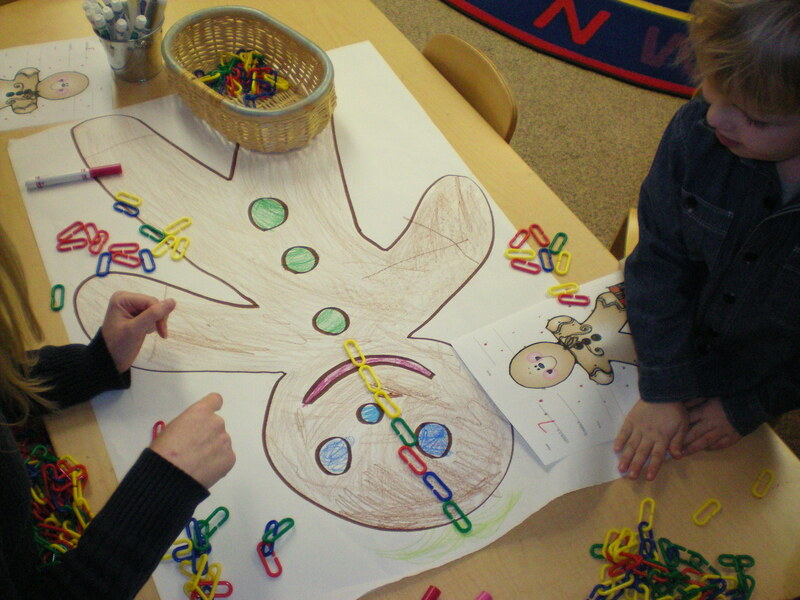 The children were asked to find the length of items such as a basket, a shelf, the dramatic play couch, and themselves using gingerbread man cut-outs. This activity emphasized one-to-one counting, writing numerals, following directions, and aligning units of measure for an accurate count. It also required the children to read the pictures on their recording form to find out what needed to be measured next. After the first two objects on the list, the children felt that it was getting a bit overwhelming. With a bit of discussion, they discovered that they could each measure a different object and then share their findings rather than doing each on their own. Team work made the task both enjoyable and manageable. ← Check out Mr. Cooper’s site! Wow, it never occurred to me that learning to measure can be so fun and creative. Great job you’re doing with the kids there!